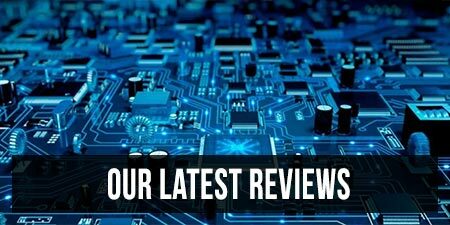 As of April 3rd 2018 Intel unveiled the revised Coffee Lake hardware platform and in this article we’ll talk about what this means for the world on notebooks for the rest of 2018 and the first part of 2019. 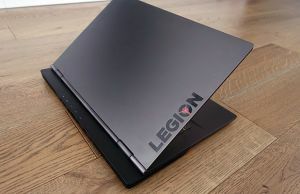 You should know that this launch mostly includes high-performance mobile processors meant for multimedia, workstation and gaming notebooks. 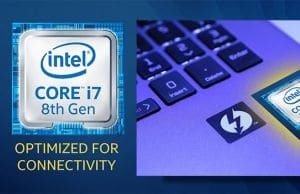 There are no additions for the ultra-portable segment on top of the existing 15W KabyLake-Refreshed platform unveiled in the second part of 2017, which we’ve talked about in this article, but there is a new series of 28W Coffee Lake Core U processors with Iris Plus graphics, targeted at a tight-niche of powerful thin-and-lights. Update: If you’re interested in the 2018 Core U platform, this article covers Whiskey Lake-U in-depth. 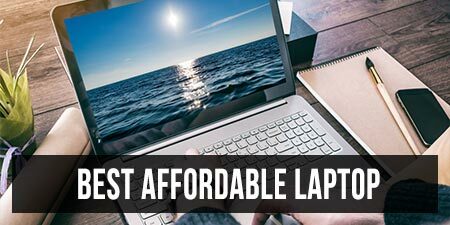 For the most part Coffee Lake is about high-performance laptops though, with the important novelties being a series of new and improved 45W mobile processors, including the first ever mobile Core i9 CPU. Here’s what to expect. 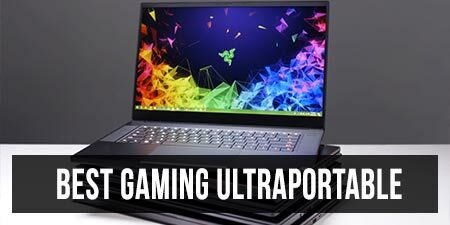 At the bottom of the line sit two Core i5 processors, the i5-8300H that will make it inside entry-level gaming SKUs and some mid-range all-rounders and multimedia laptops. 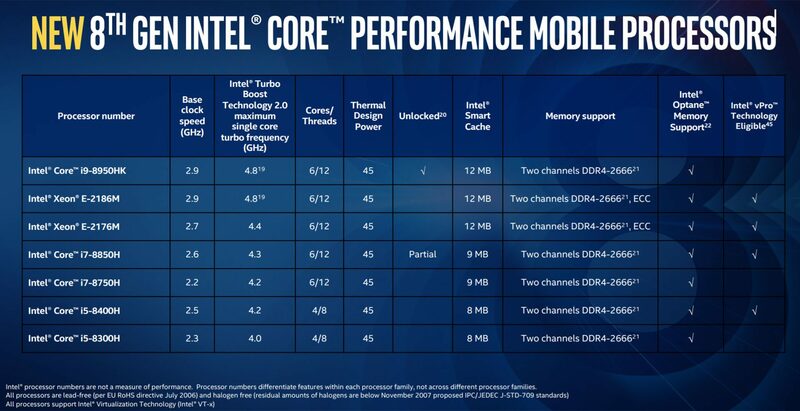 Compared to the KabyLake i5-7300HQ it replaces, it gets HyperThreading and runs and higher Turbo Clock speeds, so it comes to no surprise it’s a much faster option. 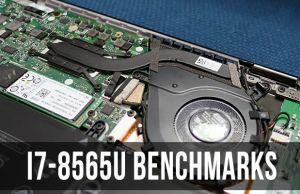 In fact, it’s even faster than the KabyLake mainstream i7, as you’ll find out from this dedicated article that talks in-depth about the Core i5-8300H processor and includes a multitude of benchmark results and comparisons. The i5-8400H is a niche variant of the 8300H with 200 MHz higher clock speeds and vPro, which means it’s meant for business notebooks. The Core i7-8750H is the mainstream CPU in the Coffee Lake Core H line and will make it inside most gaming and performance laptops released in 2018, as a replacement for the KabyLake Core i7-7700HQ. 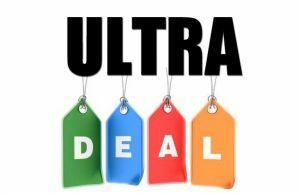 It’s a 6-core processor with 12-threads and higher Turbo Clock speeds, thus a significant upgrade from its predecessor in multi-threaded loads, as you’ll find out from this detailed article. 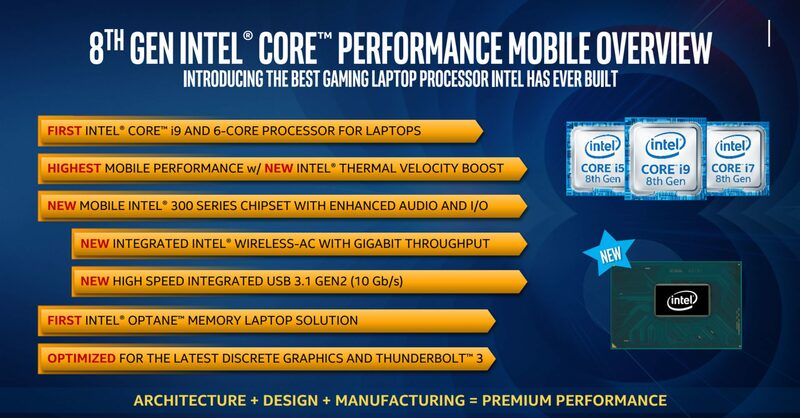 Intel also offers a main-stream i7 with vPro support, the i7-8850H, again meant for the business segments. At the top of the Coffee Lake series we get two Xeon processors and the headliner, the Core i9-8950HK CPU, all with 6-Cores, 12-Threads and 12 MB of L3 Cache. 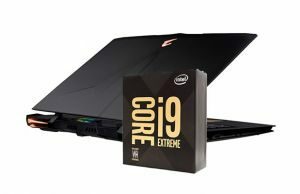 The i9-8950HK replaces the KabyLake Core i7-7820HK / i7-7920HK inside enthusiast gaming notebooks and workstations. 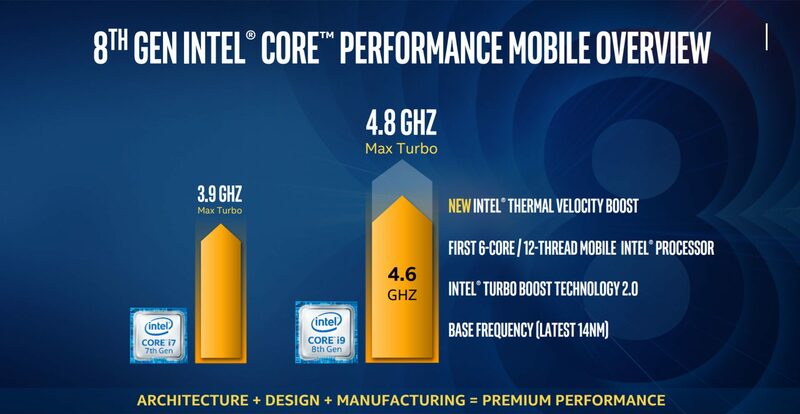 It gets more cores, more threads, higher Base and Turbo clock speeds and what Intel calls TurboBoost 2.0 and Thermal Velocity Boost (which increases the Turbo Speed automatically by 200 MHz if the power budget and CPU’s temperature allow it). It also gets an unlocked multiplier, which means it can be potentially overclocked. All these translate in better overall performance, as well as improved speeds in specific tasks like editing content, streaming, VR and gaming. 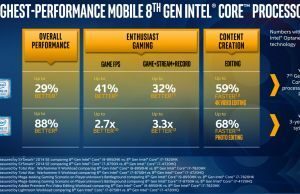 Gaming performance is highly dependable on the GPU, but the i9 will be paired with the higher end GPUs available on the market. Check out the pictures below for extra details. 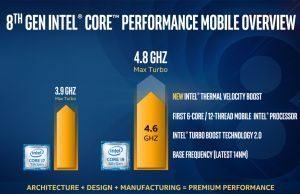 The Coffee Lake platform is not just a bump in core count, threads and clock speeds, there are also a few more fine details associated to the Intel 300 chipset that are worth mentioning. It provides improved audio, better support for Thunderbolt 3 connected peripherals and adds an integrated Wireless AC chip capable on Gigabit throughput. 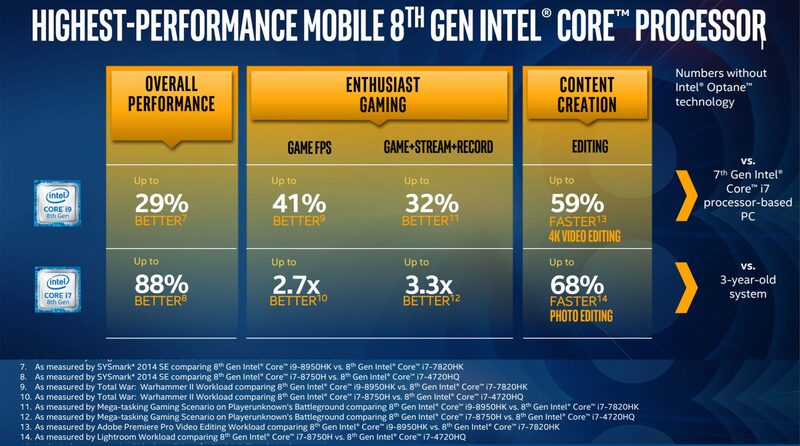 On top of all these, the 8th gen mobile platforms are all compatible with Intel Optane memory, which when implemented can speed up everyday tasks like opening large documents or loading games. We’ve yet to see an SKU with Optane memory implemented, so we’ll have to save out conclusions on how Intel Optane actually translates in real-life use. Aside from the 45W CPUs discussed above, Intel also announced a new series of 28W Core U processors as part of the Coffee Lake platform. These are not meant to replace the existing 8th gen KabyLake-R CPUs that are part of the vast majority of the current thin-and-light ultraportables available in stores right now, instead they slot between the 15W KabyLake-R Core U line and the 45W Coffee Lake Core H line. 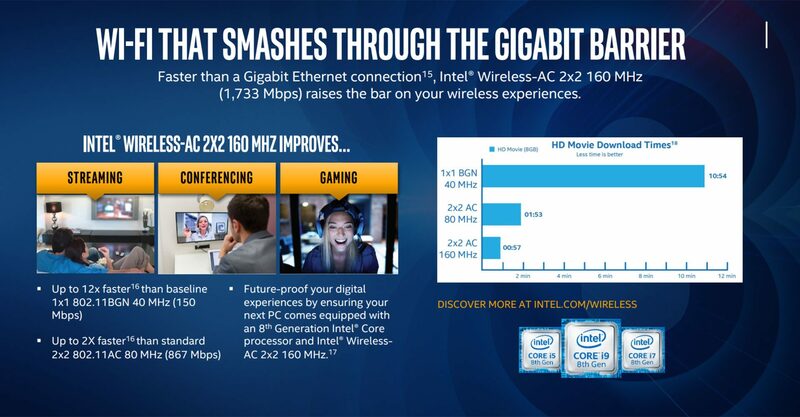 They share the Intel 300 Series chipset with the 45W Coffee Lake line and its features mentioned earlier, but the entire line consists of dual and quad-core processors with HyperThreading, TurboBoost and Intel Iris Plus graphics with 48 EUs and 128 MB of on-package eDRAM (for comparison, the Intel UHD 620 configurations available on standard 15W 8th gen processors get 24 EUs and no eDRAM). Compared to the KabyLake-R 15W CPUs (i5-8250U, i7-8550U), these 28 W variants don’t just get the more capable integrated graphics, but also run at higher clock speeds, which will translate in better overall performance in demanding loads. We’ll just have to wait and see whether this line will get enough support from OEMs. 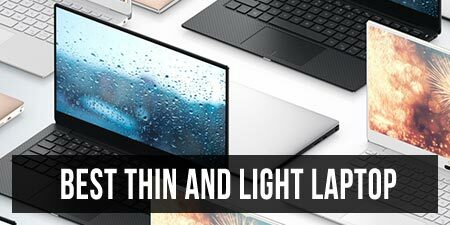 Given the experience with the previous 28W KabyLake and Skylake lines, these might only make it inside a limited number of enthusiast ultraportables (like certain business ThinkPads and Latitudes, probably the next 13-inch MacBook Pros). 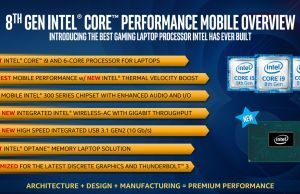 On the other hand, given how these are quad-core CPUs and the previous 28W lines were significantly slower dual-cores , there’s a fair chance some OEMs will build portable gaming laptops based on them, with thinner profiles and better runtimes than the existing gaming ultraportables based on Core H hardware, and at the same time limited losses in CPU performance. Anyway, that’s about all we know so far about the Intel laptop Coffee Lake platforms, but stay tuned for updates and our lists of notebooks built on this hardware. any information that all notebook come with i7 8750h + usb type-C it willbe default thunderbolt 3 enable ?